It may seem high, but we can do it! We are climbing to new heights for Mary Bridge Children’s Hospital. Payton is taking her rock climbing experience and applying it to her 3rd Annual Fundraiser for Dr. Hall’s Art for Heart Endowment Fund! 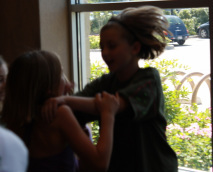 Payton has spent this year on a Rock Climbing Team and she is competing against other teams with girls ages 8-14. She has exceeded everyone’s expectations, taking 2 second places and 1 first place in 3 competitions. Eight years ago, we would have never expected her to be climbing such heights with such determination. This determination is spilling over to her fundraiser. 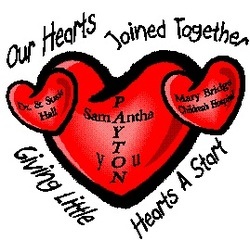 This summer, Payton would like to personally hand deliver a donation to Mary Bridge. Two years ago, all of you helped her raise $1500 and last year over $2500. This year she would like to raise $3000 or more for Dr. Hall’s “Art Cart.” As many of you know, Dr. Hall is the surgeon who not only operated on Payton’s heart twice, but he is the reason she is able to dazzle us with her rock climbing skills. So please, help us climb to new heights and reach a new record this year! Instead of asking you to sponsor Payton in an event like last year ($36 for swimming 36 laps), she is asking that you contribute what you feel you can to help her reach her goal of $3000. Since we are taking the donations with us, please make sure that you have your donation to us by August 1. We have included a self addressed stamped envelope for your convenience. Also, be on the lookout for Payton’s climbing slide show. You will receive it via email (so if we do not have your email address, make sure you send it with your contribution). 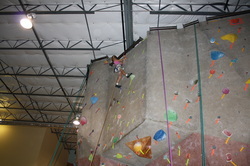 This way, not only will you see her climb, but you can also watch our donations climb the wall! We will update you all in July to let you know how our climb is going- with final numbers coming out on August 3. As always, please send checks made out to Mary Bridge Children’s Foundation. Thank you in advance for supporting the hospital that gave Payton life! 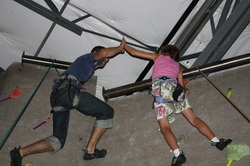 And for helping Payton make the CLIMB! Hi everyone!!! We are so excited to give you a July update with our outstanding fundraising. Thus far, your generous contributions are totaling over $1,700!! This is past our halfway mark. We are so excited to have already reach this mark and we are sure that our goal of $3,000 will be met by August 1. If you would still like to make your tax-deductible donation, just send your check made out to Mary Bridge Children's Foundation to our address and Mary Bridge will send you a tax receipt sometime before the end of the year. We have attached our original slide show and letter to this email (just in case you did not receive it), but we will have something new for you in August. Thank you again for helping me with our climb for Dr. Hall's fund at Mary Bridge. Try to contain our excitement! Hi everyone! I know that you are expecting to hear how much money we raised for Mary Bridge, but I am so excited to deliver the money in person that I have decided that I would like our donation to be a surprise when we arrive. We are going to the hospital the morning of Monday, August 10. So, I promise you will have an email by the 15th with our final donation amount. I can not wait to get there and see the hospital and all wonderful supplies that we provide for the kids who come to Mary Bridge. Thank you for your generous contributions! I wouldn't be able to do any of this without all of you! It is so exciting to see how our fundraising is growing each year. We fly out this Thursday, so we still have a few more days to receive donations, but of course if we happen to miss any, I will make sure the hospital receives them when we return home. You all are wonderful!!!! Thank you! Thank you for always supporting us! Hi everyone! We apologize for taking so long to get this to you, but we were waiting on a few more donations to get our final number. We were amazed with your kindness and generosity this year! We not only doubled our goal of $3,000, but we raised $7,200!!! We can not thank you enough for your continued support. My fundraiser for the hospital would be meaningless without each of you. I know that with friends and family like all of you, I can accomplish anything in life. P.S. Enjoy our new slide show!